The question of whether or not we are alone in the galaxy is one that has fascinated everyone from mathematicians to conspiracy theorists. But, if extra-terrestrial life forms are abundant in the Universe - as some people believe - why have they not been in contact? From Doctor Who to Superman, ET to Marvin the Martian, fiction has regularly brought aliens to Earth as friends or enemies but, as yet, no-one has proved they have ever seen an alien apart from on film or TV. In 1960, a radio telescope was pointed out into space to listen for signs of extra-terrestrial intelligence, trying to add scientific fact to the question "is anybody out there?" But 50 years on, nobody knows the answer to it. "It's probably the most important question there is," says Dr Frank Drake, who was a pioneer of radio astronomy and is considered the father of Seti - the Search for Extra Terrestrial Intelligence. "What does it mean to be a human being? What is our future? Are there other creatures like us? What have they become? What can evolution produce? How far can it go? "It will all come out of learning of extra-terrestrials and this will certainly enrich our lives like nothing else could." Back in 1961, Drake created a formula to work out how likely it was that we are alone in the galaxy, a formula which still underpins how experts view the question today. The so-called "Drake equation" estimates the amount of civilisations able to communicate with Earth. And the figure Drake and his colleagues estimated in 1961 was 10,000. Many argue over the exact figures, as the equation is based on unknowns. But if that number is anywhere near correct then the more pressing question is why haven't we got any firm evidence of their existence? This was a question posed by the physicist Enrico Fermi as far back as 1950, saying "where is everybody?" to his colleagues over lunch. It formed the basis of the Fermi paradox which juxtaposes the high estimates of intelligent life and the lack of evidence put forward. This "great silence" - as it is often referred to - draws attention to the size of the universe and how alone we appear to be. It is a paradox which has yet to be satisfactorily solved. Astronomers have estimated there to be around 70 sextillion - or seven followed by 22 zeroes - stars in the visible Universe. A recent census of planets said that there could be an Earth-like planet circling 23% of the stars in the night sky. The maths alone is an almost inconceivable headache of scope, size and scale. 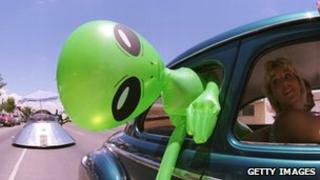 "We should be prepared" for aliens, says professor of space science John Zarnecki, from the Open University. Stephen Hawking says aliens almost certainly exist and senior Seti astronomer Seth Shostak has said that the hunt for alien life should take into account alien "sentient machines", almost disregarding the possibility that there's nothing to search for. But many scientists argue that because humans have been using wave technology for little over a century - compared to the Earth's age of over four billion years - even if anyone is out there, the window of opportunity to have similar technology is incredibly small. Indeed, the radio wave as we know it for our communication purposes, is already changing from an analogue wave into a digital pulse, a much more complex signal to detect. And similarly, the waves scientists are looking for may not be the right ones. While a larger amount of the wave spectrum is being examined, it is still a small fraction. The theory goes that no other inhabited planet is likely to be using the same technology at the same time, or at least within distance of making contact. The actual practicalities of ET phoning home would be, they would argue, basically impossible. Another theory is that with intelligence comes destruction. The time between being able to make contact and the self destruction of the species is short. Purveyors of this theory cite nuclear warfare or the creation of a man-made virus only possible with technological advances as examples of why it is likely. Image caption Is anybody out there? And many disagree about whether this is anything to look for at all. Indeed, the simplest answer to Fermi's Paradox is that there is no intelligent life to search for so none has been found. The human race is either an accidental blip in the Universe or we are special and the conditions we evolved in were unique. The Rare Earth hypothesis argues that because of the intricate design and infrastructure of our planet, the amount of coincidences and circumstances that must occur together make life almost impossible. Philosophy Professor Nick Bostrom, of Oxford University, has even posed the question whether humans are living in a computer simulation created by beings with a superior intellect. In this model, other beings would not be created within that programme. "We just haven't tried enough," he says. "We've looked carefully at only a few thousand stars and very few channels that are possible on the electromagnetic spectrum and that's hardly even a start. "If you take reasonable or optimistic values for the [Drake] equation, it suggests that right now, there may be around 10,000 civilisations we can detect in the galaxy. "That's one in 10,000,000 stars. Before we have a good chance of succeeding, we still have a long way to go." The Search for Life: The Drake Equation is on BBC Four, Tuesday 14 December, 2000 GMT and then afterwards on iPlayer. Can TV signals be picked up on other planets?